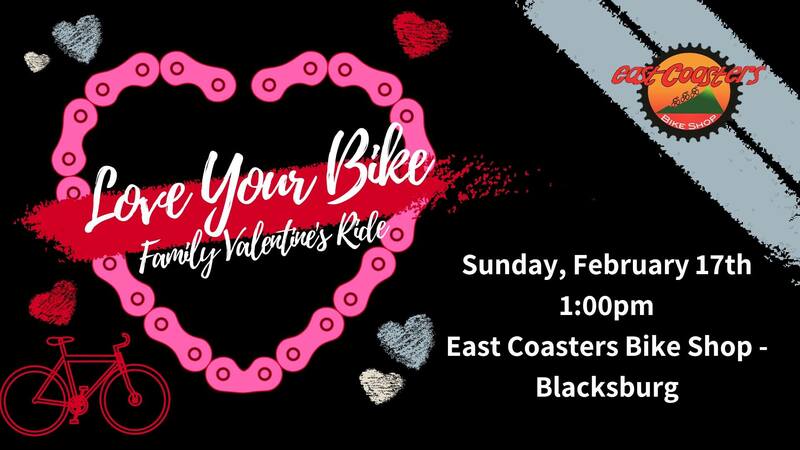 East Coasters Bike Shop presents the Love Your Bike Family Valentine's Ride on Sunday, February 17, 2019 meeting in the East Coasters parking lot. Join our Trek Women's Advocate, Janet and the East Coasters Family as we celebrate Valentine's with a family-oriented group ride. Valentine's is about spending time with the ones you love, and we want to make sure that your bike gets included in that celebration! This ride will be a socially-paced, kid-friendly, no-drop group ride. We'll mostly ride the Huckleberry Trail. It will be an out and back loop. The ride plans to depart at 1:00 pm so make sure you arrive and are ready to go before then. To sign-up for the family bike ride, visit: https://docs.google.com/forms/d/e/1FAIpQLSewqxzz-enSGptBFfRglOyLsggiAxulSMfrVR92yV-t7olpMw/viewform. All families will need to sign the ride release and waiver of liability form. To sign this form online, visit: https://docs.google.com/forms/d/e/1FAIpQLSfAazv011y4_vt8tuk6uWNduEHgCcObua4rjNDtw8DrTZp7tA/viewform. To view the event flyer, visit: https://i.imgur.com/Y3Fktxk.jpg. For more information, visit: https://www.facebook.com/eastcoastersblacksburg or https://www.eastcoasters.com/about/events-calendar-pg460.htm or call 540-951-2369 or email Janet at janet@eastcoasters.com.